Bistecca Bistro - the best steaks in Warsaw! Welcome to Bistecca Bistro, a family restaurant, where with passion and culinary love we serve you the best Polish beef. The name Bistecca Bistro indicates that our menu is mainly meat-oriented. We offer a wide variety of juicy meat served in different combinations. Bistecca is one of the most famous dishes of Tuscan cuisine, which is highly praised all over the world. In our restaurant we focus on Polish beef, and Chef Paweł Gajownik personally takes care of her choice. We aim to deliver the best quality products on your plate. As an unquestionable lovers of meat we offer you various types of steaks and other juicy meats in interesting combinations. With reference to the Italian cuisine in our menu you can also find delicious pasta and fish. Bistecca is one of the most famous dishes of Tuscan cuisine, which is highly praised all over the world. A characteristic feature of this beef steak is its T-shaped bone, that is why it is also called a T-bone steak. The steak consists of both top loin (strip) and tenderloin steaks connected by a telltale T-shaped bone. Steak should be at least two centimetre thick and weigh 600 g but some of them weigh even up to 2,5 kg. Meat comes from a grown-up animal (a 18-20-month old). Steak is grilled until it turns golden-brown outside and carefully watched to make sure that it is juicy and tender inside. Bistecca is sprinkled with salt right before serving. In our restaurant Bistecca is served directly to the table by the Chef. It is brought on the trolley decorated with vegetables. He cuts slices of steak at the table, drizzles it with olive oil and seasons with freshly ground pepper. Steak is served with grilled vegetables, roasted potatoes in herbs and two kinds of sauce – spicy salsa and the sauce based on Jack Daniels whisky. As one of the first we started serving aged beef. Now, this process is also happening in our restaurant. In a special refrigerated cabinet, the selected Polish beef matures dry in a strictly defined temperature and humidity. Under such conditions we keep it for a few weeks. During this process, the meat loses a lot of moisture – the overlays of the seasoned elements wither, and then they are cut off. What is inside becomes brighter and more crisp in taste. This is how we season our rostbeef and entrecote. 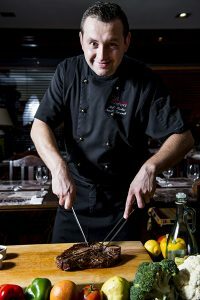 The chef Paweł Gajownik is associated with our restaurant since 2012. His commitment and sense of taste are appreciated by guests from all over Warsaw. He personally choose the best quality products, especially beef, which undoubtedly reigns in our restaurant. He gained his experience working in famous Warsaw restaurants. He arranged sumptuous dinners for such celebrities as Prince Karol, Pedro Admodovar, Lech Walesa, Bronislaw Komorowski, and his menu was served to many distinguished guests at the Presidential Palace. In our restaurant we organize various events and business meetings. Our restaurant provides professional catering in Warsaw and its suburbs. For lunch we recommend our desserts at a special price of 8 zł.